Nearly 80% of recently established self managed superannuation funds (SMSFs) operate under an individual trustee structure rather than a corporate trustee arrangement, according to statistics released by the ATO. Data shows corporate trustee is the less popular option but does that mean it is the less wise choice? Let’s look at the advantages and disadvantages of each trusteeship arrangement. Under an individual trusteeship, all SMSF assets must be in the name of all trustees. Each time a member of a fund with an individual trusteeship dies, retires, loses capacity, leaves the fund or a new member joins the fund, trustees are required to amend the ownership of their investments by notifying all relevant share registries, banks and titles offices. Complications may arise if your fund has numerous investments – particularly in real estate and shares – because a transfer of the new titles for all assets is likely to require a significant amount of time, effort and money. Trustees must also prepare a deed of appointment and retirement for each incoming and outgoing trustee. On the other hand, when a corporate trustee is used, the addition or retirement of a member of the fund requires only notification of a change of directors. The legal title of all assets remains in the company, which continues to act as trustee. The only thing that corporate trustees have to do is notify the Australian Securities and Investments Commission (ASIC) within 28 days of the change. According to trust law, a sole member fund, which has also a sole individual trustee, cannot exist. A sole member SMSF must have at least two individual trustees and while the second person does not have to be a member, they do have to be the member’s relative and be actively involved in the trustee decisions made in relation to the fund – a disadvantage if a trustee wants full control. What’s more, the incoming person is required to sign a “trustee’s declaration”, which is designed to make trustees fully accountable for their actions and fund compliance. 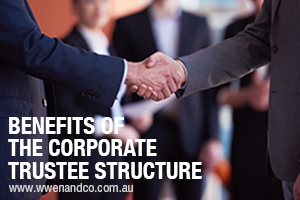 Under a corporate trustee structure, a sole member SMSF can exist. An SMSF can have an individual who is both the sole member and the sole director of the trustee company. When an individual trustee leaves a fund or dies, the fund may face administrative difficulties, for example if it is reduced to a single member fund. However, a company has an infinite lifespan, and therefore the operation of a corporate trustee SMSF can continue even after the death of an individual SMSF member/director. Accordingly, a corporate trusteeship ensures greater flexibility for estate planning as the trusteeship does not change after the death of a member. Whichever structure you choose for your SMSF, there are costs and fees. It may cost a bit more to set up a corporate trustee, but that might be a small price to pay compared to the cost and effort involved in changing ownership documents. If your SMSF breaks the super rules, each trustee can be fined thousands of dollars. If you have individual trustees, this will cost more in fines because the penalty is applied to each individual trustee. If you have a corporate trustee, it receives only one penalty and the directors share the cost between them. SMSF challenges? Please contact the chartered accountants at our Epping office to help identify the best structure for you.